This Marvel Legends 3-Pack is one of the problems we are facing with the toy industry. The large number of repaints for a single figure. The companies, in this case Hasbro, is trying to cut the cost on their tooling by reusing bodies. That is all and fine, to an extent. What they have started doing is reissue figures with new paint apps in three packs. Generally one figure we need, and two we don’t. Then they change the same amount as if we were going to buy the three characters individually. I would really like to know the thinking behind this. What we are ending up with is a bunch of this three-pack sitting on the shelves of Target. In the meantime, someplace like Amazon gets a hold of the set, sees the writing on the wall, and drops the price down to $20. That is where I found it, and for that price, it is like getting Spider-Man for regular price, and getting two bonus figures for free. That is a deal I can get behind. But now the question is, does that hurt Hasbro overall? Another example is the Rogue One three-pack that came out recently. That set had the opposite problem. Two figures we do want (Death Trooper Specialist, and Cassian), and one figure that was in mass market already (Jyn in her Jedha outfit). What that one caused was a huge number of Jyns to be sitting on the pegs at the stores. It seems that overall the problems mount with the reuse of bodies as opposed to actually going about doing something new. I was not going to pay $60 for a 3-pack that included dirty versions of Cap and Iron Man, just to get Civil War Spider-Man, when you know we are going to be getting one upcoming for the Homecoming movie. But with the price reduced to $20, that was just right. So let’s take a look at this trio and see what we get. Spider-Man is in his new movie outfit with black accents. I think it works well, and I think he was a great addition to the movie. The outfit is a modern take on the classic outfit. Gone are the days of the puff-paint spider webs. Even on his back, we get the classic giant red spider. Nice touch. In the packaging, Spider-Man comes packed with Cap’s shield in his hand. That of course references his stealing of Cap’s shield during the film. He does not come with any accessories of his own, so they let him borrow Cap’s for a while. 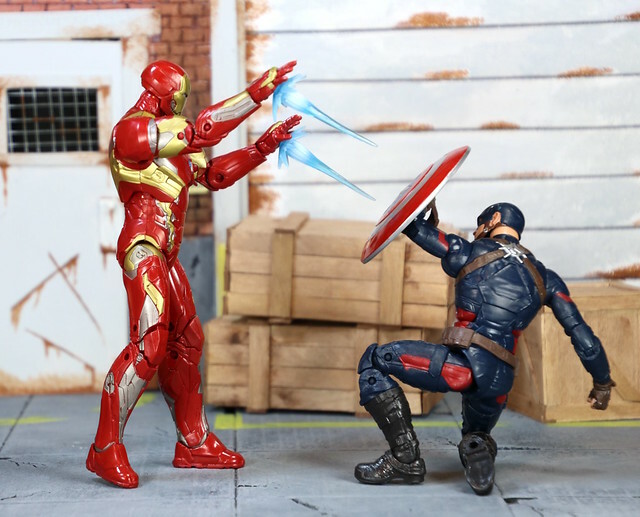 Captain America is a battle damaged repaint of the Civil War Cap. Nothing special going on here, except for a bunch of burns all over his outfit. Steve comes with an alternate unmasked head. It is a good sculpt, but it does not look a lot like Chris Evans. I would really like to have seen some paint added to the face. I bit of dirt and grime to match the clothes. Iron Man took a lot of damage in the movie. He looks pretty badly burned in his repaint. This is also a repaint of his Civil War armor, the Mark 46. This is one of my favorite armors that Hasbro has put out. There is a lot of detailing and colors going on here. His back is strangely untouched. It seems that he should be battle damaged all over, not just on his front. Tony comes with the most accessories. He comes with hand blasts as well as feet blasts, and they are in two different colors. He also comes with a maskless face. It is really unfortunate that he does not have any paint apps to the face. He pretty much spends the entire movie with a beat-up face, and it should have been reflected in this face. By the time his armor got this messed up, he was already physically beat up too. Overall, this is a fine set. I am glad I waited for the price to drop. Spider-Man is great. he looks good, and he fits in so well with the other movie figures. The other two are just minor repaints of their original figures, so paying full price for a little bit of black paint would have been hard to swallow. But at $20 for three figures, this was a deal too good to pass up. That seemed to have been the bottom price. It stopped there, and now it is slowly climbing back up. As we continue to look at the comic book side of the Giant Man Series, we get a look back to the good ole boss of SHIELD, Nick Fury. Back in the day, this guy with grey sideburns was the man. Probably broken a bit by his live action portrayal by David Hasselhoff. He is a well done figure. Pretty basic body, but really the bodies that are being used now by Hasbro are the best (in the price range). He comes in a great outfit with some great details. It is modern enough to fit in with other SHIELD figures like Maria Hill. If you want to vary it up, you get a choice of heads. First up, Dirk Anger. Who the heck is that? I didn’t know, but thankfully Wikipedia did. He is apparently a creation of the great Warren Ellis and Stuart Immonen, who wanted to use Nick Fury, but couldn’t/ So they turned Fury in to Anger and ran with it. To have it added to this figure’s accessories is amazing and fun. You also get a SHIELD agent head, which I have seen in droves all over the internet at an army builder. I have only ever seen one in the wild, and it is this one, so no army building for me. Nick is a great figure. He is a good throwback to the comics, and who better to have in a Civil War line than the man in charge of SHIELD? Well, this is a good choice for a comic figure for Hasbro. Basically take a new head sculpt and stick it on a repaint of the comic version of Captain America. They even are able to use Cap’s comic version shield too. For us, Meh. He is not used since the fall of the Soviet Union, and really we have moved passed the Cold War era stuff. I am a huge fan of WWII, so Cap is great, and so are all of the comics from the 40s. The Cold War just doesn’t do it for me. Red Guardian is a fine figure. This Cap body has been used a few times now, for figures outside of Cap. But since this is supposed to be the Commie version of Cap, it is a natural choice. I just think this is not going to be anyone’s choice of a favorite figure. He will be lost to time at the back of the shelf of more interesting and relevant figures. Time for the Big Boy. THIS is what Build-a-Figures is all about!!!! Give us parts for a figure that will end up being half again the size of the next figure. This time around, you needed to get your hands on all six figures to get the parts to build this guy. Scott Lang is sporting his outfit from Civil War, of course. It is an updated version of the Ant-Man costume from his first movie. I really liked the first costume, and didn’t think it needed an update, but if you are going to go extreme with size changes, you might want to make sure your outfit can change with you. You do not need a wardrobe malfunction when you are that tall. 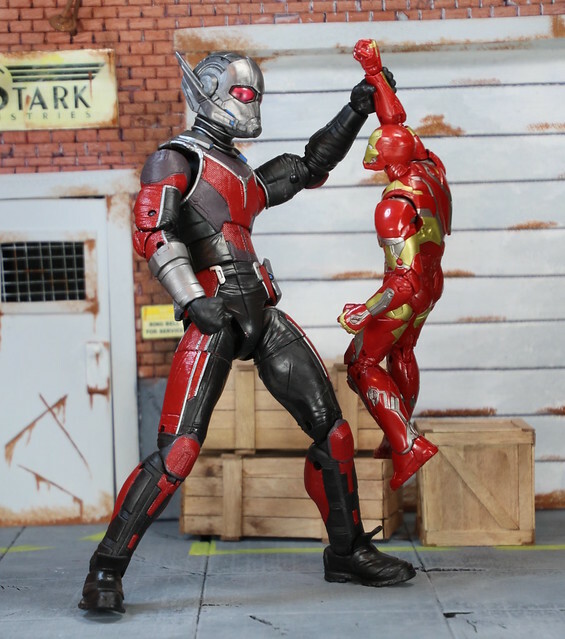 I have a feeling that it is no coincidence that the Giant Man figure came out just before the new 12 inch line of Marvel Legends. Hasbro really did a good job of upscaling their line to make sure that this really big figure still functioned the way the smaller figures did. At 10 inches, he is more than tall enough to take on the baddest of bad guys and make his presence known. The details of his outfit scaled up so well. The textures of the materials are great, and the details get better with different gloss and matte paint schemes. His face is the best part, as with most of the best figures. He wears a full helmet this time around, so his face is hidden more. 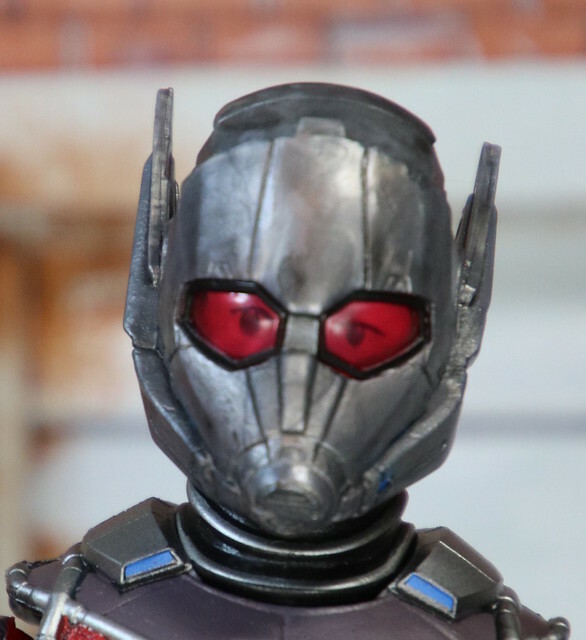 So Hasbro went and added clear red lenses on the figure with eyes on a molded face underneath. This is another case where money could have been saved by just painting the lenses red. But they went the extra distance, and really gave the collectors a treat. And the collectors will not forget that. We get the bum end some times, but others are shining moments that we carry with us to the next wave of figures. The only problem I have with the whole figure is his left hand. It is the open hand of the two (the other being a fist). I feel like the fingers are a little fat, or maybe not long enough. Either way, the hand is a little bulky, and the opening could have been a little wider. As it is, with a bit of a struggle you can get an enemy’s wrist in there for holding. This is another great line for Marvel Legends, and Hasbro. I like the movie side of the line better than the comic side. It feels like the comic side had to dig pretty deep to fill in three figures. Fury is a natural choice, but Nuke and Guardian are a bit old school, and out dated. and Spider-Man, Captain America, and Iron Man (beaten to a pulp in a three pack). That is 8 more figures added to the 7 already released. This is the biggest wave ever for Marvel Legends. 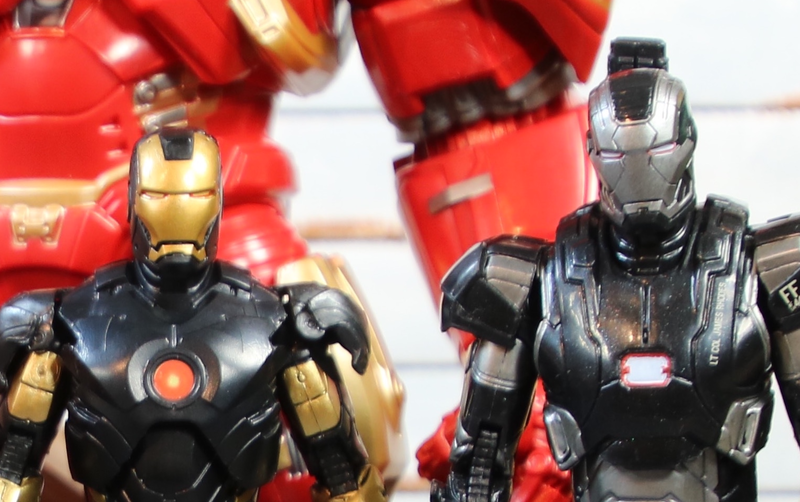 I am pretty sure the first time we have a repaint (Cap and Iron Man 3-pack) in the same wave. Well, that is the end of the Civil War’s main lineup. On to other stuff for a bit before we head back to Marvel in a little while. We have so many other things to look forward to here in the near future, so stay tuned! The Civil War movie was very polarizing for fans of Captain America and Iron Man. I was on team Cap, while my wife went for team Iron Man. We had a lot of fun poking one another during the movie as each made good points about their stand on all that brought about the Civil War. Captain America is another Captain America. I have 7 Captain America’s just in the Marvel Legends line, though there are even more that I do not have. This one is a good representation of Cap from the movie. His outfit is so very nicely detailed, from great molding to a really nice paint scheme. He is ready to battle with all of the articulation you expect from the Marvel Legends line. Hasbro has really gone for it, and has spread the great articulation through all of their lines of 6 inch figures. So much so that other companies have jumped onto the 6 inch bandwagon to capitalize on the ever growing 6 inch market. Steve comes with his trademark shield. This one is the movie version. It has the straps on the back to be held on the arm only. There is no peg like the comic version to be attached to the back. Iron Man is decked out in his Mark 46 suit this time around. He is looking good with the red and gold, and a bit of silver in there for good measure. 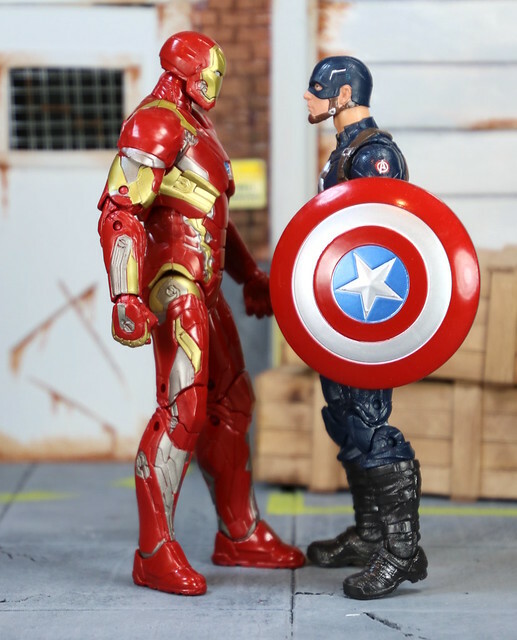 We have had a LOT of Iron Men over the years of Marvel Legends. Some great, some good, but the movie figures have the best details. This version of Iron Man comes with open and closed hands. His open hands have a port to add repulsor beams that are beautifully painted in blue and white. They give a bit of extra detail to allow for more playability. The only problem I have with the hands are the lack of movement at the wrists. If he is using the the repulosors as a weapon, he has a bit of a funny stance while firing them toward someone. This is a great start to the Giant Man Series. We get the main characters from the Civil War movie. I was a but surprised at first that this wave was half Civil War, and half Comic. Then I saw what they were up to. This wave of 7 figures has been extended to add 8 more figures in exclusives and box sets. That turns out to be a whole lot of figures under the Civil War branding. I am so excited about this find. This morning I had to go into my classroom to check on the fish and the plant. There are only a week left of summer before I head back to teaching. On my way from school, i headed off to a close Target. They generally are hit and miss with stuff I want. This time they had something totally different. This is the new Power Rangers 6.5 inch figure line. It was not supposed to be released for another few days, but there she was, the Blue Wind Ranger, sitting there all by herself in the shelf. I don’t know where she came from, but I am glad I found her. I am pumped for this line. It is going to be so cool. The main features of this line is a figure in a new larger scale. The figure comes with weapons, and Build A Figure parts for a Zord. The first wave is based on Ninja Storm. This is a great starting off place. They can put out the three main characters from Ninja Storm, and throw in a couple of Mighty Morphin’ Power Rangers, and really get people excited for this line. Tori comes with her Ninja Sword, as well as a sheathed version that can peg into her back. She also comes with the Dolphin Zord arm, and one of the legs. The figure has a great range of motion. More depth of movement than many of the Marvel Legends figures. These figures have the big ball jointed wrists we saw in the larger 7 inch Armored Power Rangers line. They are not the prettiest, but they are very functional. Since this is the female figure of the wave, there is a skirt, which does hinder the leg movement in the hips, but there are slits on the sides of the skirt to allow more movement than the ladies of the 5 inch line. In addition to great movement in the legs, including double jointed knees, there is also great movement in the arms, waist and upper torso. She even has neck movement, swivel as well as pivot. This series is 6.5 inches, and it looks like they are all going to be the same height. In the initial release, Blue, Red, and Yellow are all the same height. In the 5 inch series, the female body was about half a head shorter. This is a good thing as I compare Tori to Captain America. She is slightly taller than Cap, which is not a bad thing. We have a lot of Marvel Legends women coming out that are substantial in size. I was hoping that the male figures were not going to be half a head taller again, as they would be too big to fit in with the Marvel Legends. At this rate, they are close enough to play together. Compared with a slightly taller Iron Man, she is a touch smaller. I am happy overall with the size. They fit in well enough that this is going to be lots of fun for toy photographers. And the style is well done too. In the 5 inch series, the figures are rather plastic. Very shiny. Some of that shine is taken away, and there is more of a matte finish to the outfit, while keeping a shiny helmet. I love the direction this line is going. I don’t know how great the Zords are going to be. Slightly taller than the figures, similar to Marvel Legends BAF. It seems like it would have been better to build a special character, rather than a Zord. It seems like Bandai is going through the line-up of Zords and giving us the big ones anyway, so it seems redundant to give us one that is about 8 inches tall. I am really looking forward to the rest of this wave, including the other two Ninja Storm Rangers as well as the Red and Green MMPR. Today we are looking at the final two figures in the Hulkbuster Wave. Blizzard, and the big guy himself, Hulkbuster. Blizzard is a character that is a bit below my radar. And rightfully so. He seems to be 3rd tier at best, but at least a part of Iron Man’s rogue gallery. He is simply constructed. He has a special head, but the rest is done with paint. This is a great body that they use. It is very strong and has great muscle texture all over. He has a menacing looking face, with angry eyebrows and no mouth. It would have been nice to get some sort of power burst with him to get something at least. It looks like he is standing around getting angry for the most part. Hulkbuster is huge! I expected him to be heavy as I was buying the team and could feel heft, especially in the legs. He comes with two legs, two arms, a torso, a front and back piece for the chest, and a tiny little head. He goes together easily for the most part. The head popped right on. The arms easily went onto the their holes. There was a bit of a need for some extra strength to get the legs onto their posts, but I managed. There is a post that sticks up out of the lower torso and attaches into the upper torso. Mine is stuck and does not swivel to the sides. I can get side to side movement, but no twist. So, as for now, my Hulkbuster is slightly off center. Overall this is a great wave of figures. They give a good look across the board, and they have a fantastic build-a-figure on Hulkbuster. It will be a while before they live this one down. It is like the Sentinel back in the day. All other BAF figures were held to that standard, and it took a long time for some people to get over that one. Now we have the new standard, and the bar is set high! Today we look at the Iron Men from the Hulkbuster Series. Well, hello there, War Machine we have already seen. Nothing new here. We saw it as Iron Patriot, featuring Col. James Rhodes, in the Iron Monger Series. Same figure with the blaster on the shoulder. He is missing a bit of good articulation in the ankles, which makes it hard to pose. He comes with an alternate head, with the mask up, so you can see Rhodes face. It is not the best face out there, but it works. I would love for Hasbro to figure out this dead eye problem. We have seen it in the Star Wars figures too. I had a really hard time getting the head to pop on. I think with this version of War Machine, we are ready to start playing Civil War. Um, Iron Man, you are tiny. Something went terribly wrong here. He is half a head shorter than War Machine. This version of Iron Man is black and gold repaint of Iron Man 2. What we ended up with was fairly comic accurate, but overall, we have come a long way past these days. It is a fine figure for the shelf. Nice to see a black Iron Man amongst a shelf of red, but we have seen many better Iron Man figures in recent years. He is a necessary figure to bulid Hulkbuster, and he looks fine on the shelf, but I don’t think he will be coming out to play very often. These two make a great combination. First off, the metallic dark red is a beautiful color. Match it with lots of gold chrome, and it looks amazing. The Iron Man car (#1) looks like something that Tony would concoct to get a suit to him quickly. I could see this drive down the road and transform to go onto his body. It has jet engines in the back, and a bit of clear blue plastic here and there for a great additional touch. The Hulkbuster Iron Man (#19) is even more amazing. Now this one, I could see driving suits around waiting to be called into action. It has the matching metallic red and gold chrome. Of course the Hulkbuster suit was not much without Iron Man inside to control it. Fear not, this version of the Hulkbuster also fits the Iron Man car into the back. Iron Man fits in there nice and tight. There are some indents in the floor of the truck bed that allows the Iron Man car to stay in place very well. This is a fantastic vehicle for car collectors, comic collectors, and the kids who just want to play. I would be very sad to see this paint job get ruined by rough play, but then it will be a “Battle Damaged” version, right?